One of the latest entries in Hasbro's Combiner Wars toy line, Breakdown is a member of the Decepticon Stunticons, that can combine to form the powerful Menasor! We'll be looking at him on his own for this review. 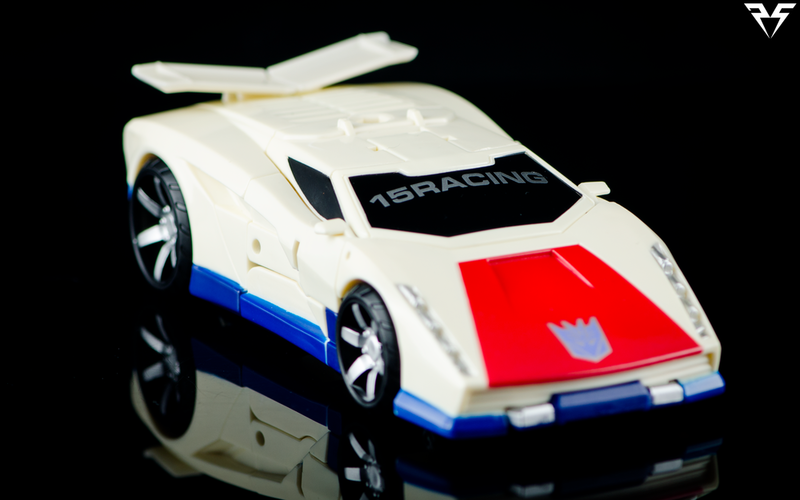 Breakdown’s vehicle mode is a sleek sports car heavily inspired by the Lamborghini Countach, molded in a milky off-white. He has a strange V shaped rear spoiler that looks a little odd even to an automobile novice such as me. The vehicle mode is very clean with simple and effective paint apps. He has a gorgeous blue trim running along the bottom of the vehicle starting from the rear tires, wrapping around the front of the vehicle. His hood is painted a deep red with a large Decepticon tampograph applied front and center and even the headlights are painted silver! The windshield and windows are painted black with a “15 racing” tampograph along the windshield. The relevance of this livery eludes me; if you know what it is referencing please fill me in! All in all the vehicle mold is slick, clean and looks fast. It’s definitely high points so far for this figure. 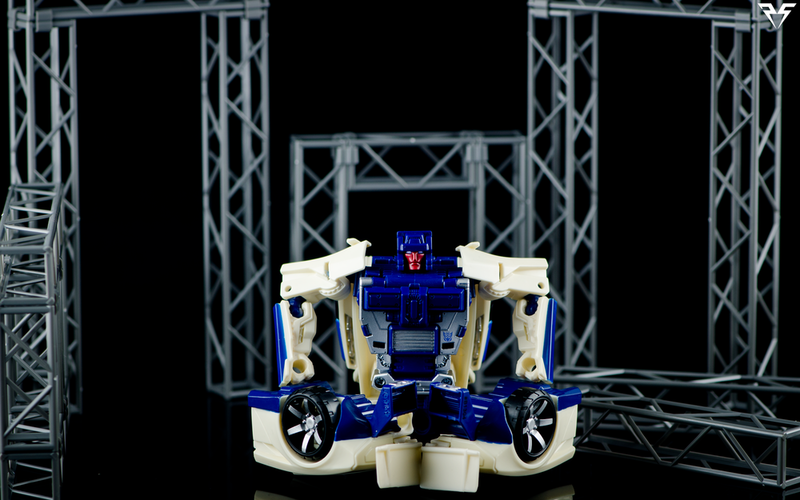 Breakdown’s bot mode is an explosion of color, turning the toy from a primarily bone white car into a blue and silver bot! He’s got the traditional square helmeted head with a painted red face and blue eyes that sparkle in th-- waitaminute-BLUE EYES!? Oh well, other than the lack of yellow eyes his head is fantastic and absolutely screams G1 cartoon Breakdown. With a little yellow paint you can get him looking just right. He has a nifty chest panel that helps to hide his combiner peg and nicely homages his original g1 chest. Due to transformation he has a double elbow that really helps when posing him with his gunblade sword. Ball joints on the shoulders, elbows and hips allow for a dynamic range of sword wielding poses. By far the strangest portion of his posability and transformation is due to how his lower legs transform. They are on a hinge that basically swings out sideways and clips in with a soft connection. It can sometimes can come loose when playing with him. I was able to use the transformation joints in his legs to pull off this seated pose. Breakdown ships with his Sword/Rifle and a purple hand/foot/gun combiner piece. With 2 large intake/cannon barrels. This one is painted purple, instead of being molded purple, and next to the other 3 actually stands out a bit as a different color. Breakdown is an awesome little car robot. He looks the part of the classic G1 cartoon character, with modern elements inspired by the IDW comics universe. The posability is on par with most modern mainline figures and he looks great with his team. If you are liking Hasbro's Combiner Wars toys, then this is yet another fantastic entry in what is turning out to be a killer line. Check out the gallery below for more photos!